The first tournament was the culmination of the U12 Nationals. Two of our three pairs had come through the qualifying round held previously and qualified for the prestigious Elite tournament. The 32 best pairs in the country descended on Eton. 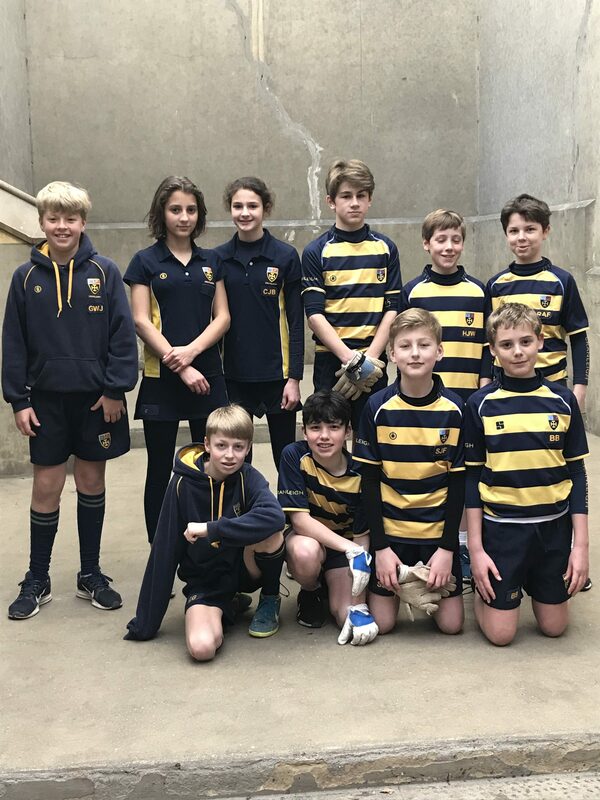 All the major forces in the game were there and we travelled in hope rather than expectation, as we struggle to match the court time which some of the schools are able to fit into their hectic schedules. 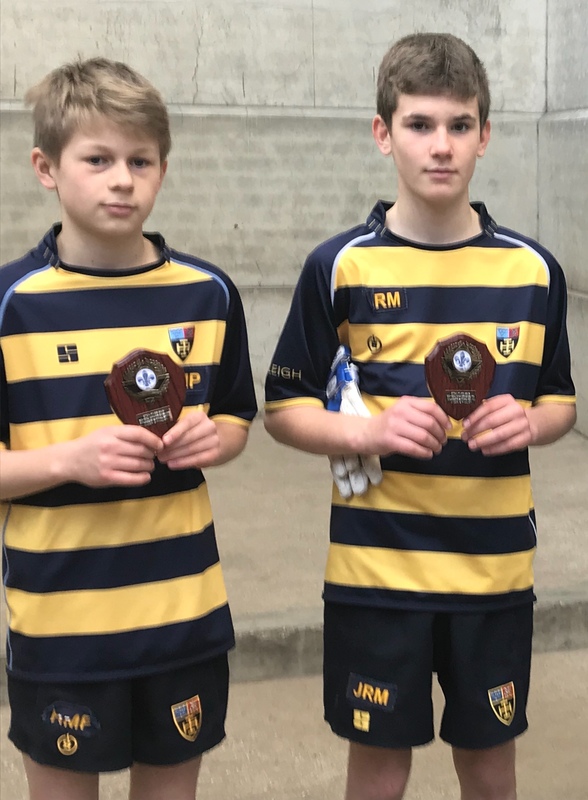 Pair 2 of Ivan and Rory came through the preliminary rounds, coming second in their group with their only loss being to Berkhamsted 1. Unfortunately they went out at the next hurdle but can be proud of their performances this term. They have both become very talented players who just need to become more consistent and to make fewer mistakes. I have high hopes for them next year. 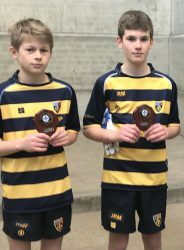 Pair 1 of James and Henry meanwhile won their group which saw them reach the last 16. It was particularly impressive to see how they just kept improving and learning. Both players exceeded my expectations and kept stepping up to the mark as the standard of play increased. They cruised into the quarter-finals with a comfortable win. 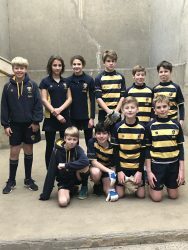 Next came Sunningdale 1, who were comfortably despatched in straight games. The semi-final saw us pitted against perennial finalists, Summer Fields. James and Henry, however, were undaunted and came through unscathed, once again without dropping a game. The final saw us pitted against a very strong Berkhamsted pair. This game proved just a step too far and we were defeated in straight games. Mark Halstead, team coach, says “Although we have had great success with the girls in recent years, this is the first time that our boys have reached a National final. It was a truly amazing achievement as we really should have no right to challenge and be competitive at this level. Unlike at other schools, where they have courts in their playgrounds and dedicated Fives professionals, all our Fives takes place after school as an optional activity. The key to success, I believe, is down to the talent and determination of the boys and to the ground work put in by Mr Till and Mr Thomas over the previous year”. 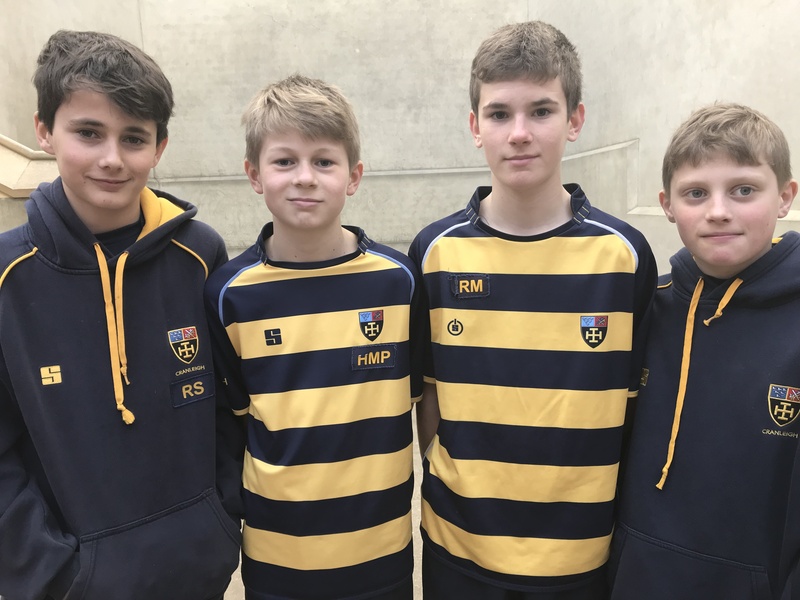 On Tuesday the u13 boys had their turn in the spotlight at the Prep Schools’ tournament. This is always a very competitive affair but I was delighted with the performance of the team. Pair 1 had the distinction of reaching the final of the Roddy Forman salver, beating the pair 2 in semi-final. In a close game they narrowly lost to a useful Berkhamsted pair. With a little more belief I think it was a game they may have won. However, this should not take anything away from all the enjoyment we have had this year.